Under Swiss law so-called contracts for prostitution are considered void as they are contra bonos mores or «immoral» according to article 20 paragraph 1 of the Code of Obligations. Yet what is considered to offend against common decency is unclear, and the definition of the term «immoral» can change over time. The authors outline how this change has affected court rulings and academia in Switzerland, Germany and Austria. They argue that contracts for prostitution are not contra bonos mores (any more). Such contracts are primarily governed by the provisions on the mandate; it is not necessary to introduce special legislation. The right to publish the text in ex ante without remuneration. The author has the right to publish the text elsewhere (digitally or in print) three months after the first publication in ex ante. In every subsequent publication the author must include a reference to the first publication in ex ante. The publication on the author’s website or the research platform of his/her university is permitted immediately after the first publication in ex ante. A reference to the publication in ex ante is required as well. 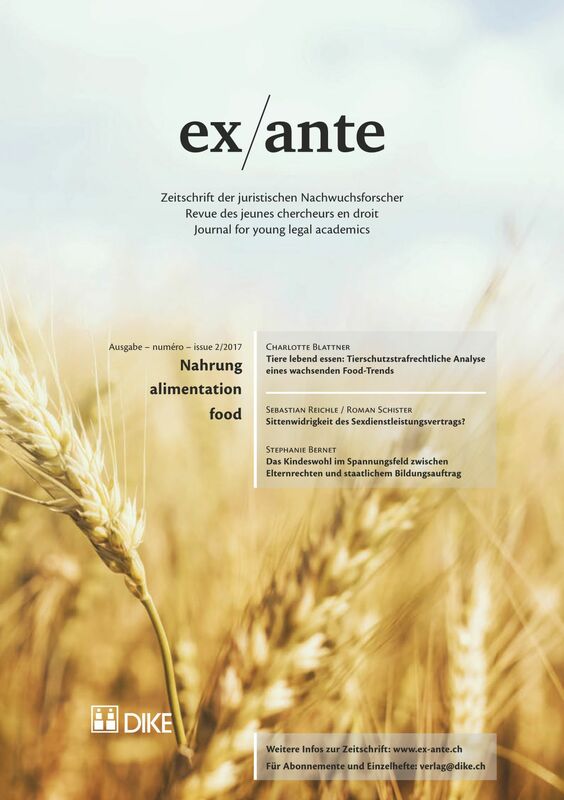 The right to reuse the text of the article published in ex ante (digitally or in print, e.g. for reprints of the journal or publication on the Internet or in other digital or analogue versions).